The Board of Regents of the University System of Georgia has approved Dalton State to extend in-state tuition to eligible residents of Tennessee beginning with the spring 2018 semester. The board took the action at its November meeting. 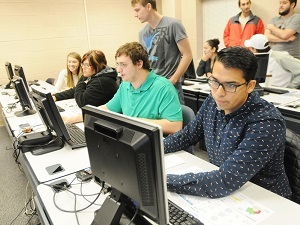 Dalton State was one of 13 USG colleges and universities granted permission to extend out-of-state differential tuition waiver status to border state applicants. “While Dalton State previously offered out-of-state tuition waivers for residents of two Tennessee counties bordering our service area - Hamilton and Bradley - we are pleased to be able now to offer out-of-state tuition waivers to all Tennessee residents," said Dr. Jodi Johnson, vice president for student affairs and enrollment management at Dalton State. “We believe our 23 baccalaureate offerings, newly-opened residence hall, comprehensive intercollegiate athletic program and vibrant student life program, coupled with an affordable in-state tuition rate, position Dalton State as an attractive option for Tennessee residents." “Our reputation as a high quality four-year college coupled with our affordability will allow us to better serve this region,” Dr. Venable concluded.